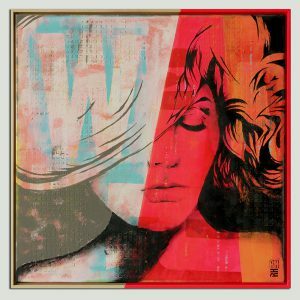 Ronald likes to use graphic elements in his paintings, due to his background in graphic design. 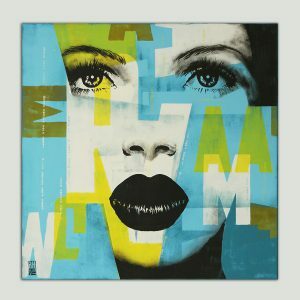 ‘Pop Art Girl’ is a serie of paintings where he mixes a female portrait with typographic form. 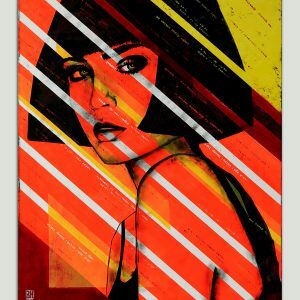 Combined with the neon orange and yellow color palette, 'Lady Orange' is a vibrant statement piece. This is an original artwork made by Ronald Hunter. Size: 90x110 cm (35,4x43,3") Please choose your optional frame in the choice menu below. Read about our frames[popup_anything id="5045"] Choose 'custom frame' if you would like to receive the white frame in the photo. 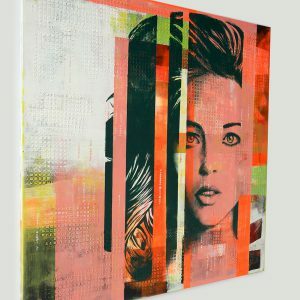 Want to receive this painting in a different size or color palette? Feel free to get in touch. Meet 'Neon Squares'. Inspired by the Pop Art movement and the work of Andy Warhol, this colorful painting with neon pink will fire up your home. Ronald Hunter has a background in graphic design, and he likes to play with typographic form in his work. 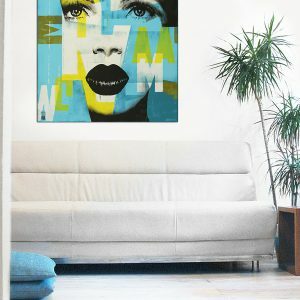 'Pop Art' is a serie of paintings where I mix a portrait with typographic form. This is an original artwork made by Ronald Hunter. Size: 90x110 cm (35,4x43,3") Please choose your optional frame in the choice menu below. Read about our frames[popup_anything id="5045"] Want to receive this painting in a different size or color palette? Feel free to get in touch. 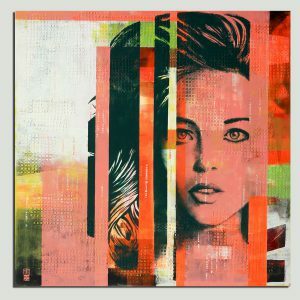 Meet “Pop Art Girl in Green”. 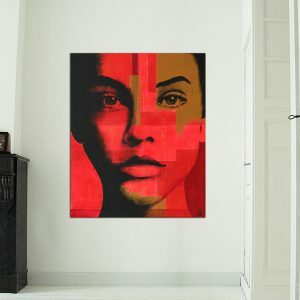 A stunning composition that brings together typographic form, color blocks and on top a portrait, coarsely painted. 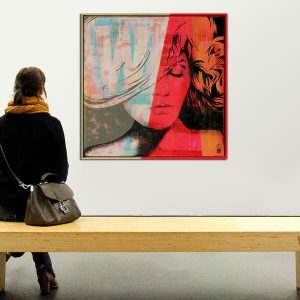 The Pop Art Girl is painted in dark green, which adds a nice contrast to the neon orange and pink background. This is an original artwork made by Ronald Hunter. Size: 120x120 cm (47,2x47,2") Please choose your optional frame in the choice menu below. 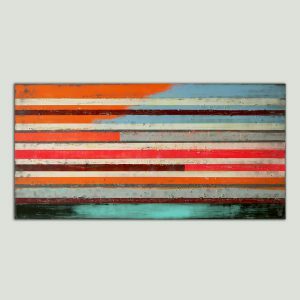 Read about our frames[popup_anything id="5045"] Want to receive this painting in a different size or color palette? Feel free to get in touch. Inspired by the Pop Art movement and the work of Andy Warhol, this colorful painting with neon pink will fire up your home. Ronald used layers of acrylic paint and texture to create depth, and you can see he played with typographic forms. On top he drew a face, with hard lines, coarsely painted. Only half is exposed, leaving the other half to your imagination. This painting is made to order. It will be created by Ronald Hunter in the same style and colors. Please read about our made to order art [popup_anything id="5011"]. This painting comes with a wooden frame, partly painted pink to match the style of the artwork. 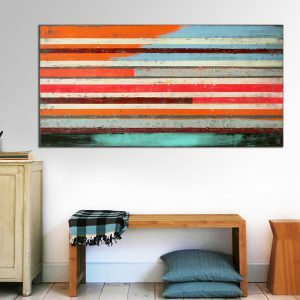 Want to receive this painting in a different size or color palette? Feel free to get in touch. Meet “Vintage Blue Wonder”. 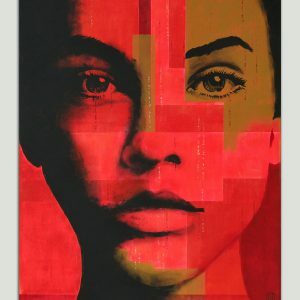 A stunning abstract portrait by Ronald Hunter that brings together typographic form and color blocks. On top he added an iconic portrait, coarsely painted. The light color tones bring a nice freshness to the artwork. This is an original artwork made by Ronald Hunter. Size: 90x90cm (35.4x35.4"). Please choose your optional frame in the choice menu below. Read about our frames[popup_anything id="5045"] Choose 'custom frame' if you would like to receive the blue frame in the photo. Want to receive this painting in a different size or color palette? Feel free to get in touch.